I have been using Ooma successfully in my previous house. I recently moved into a new construction house. The landline (qwest) people have not been to the house. All of the phone wiring is just dangling in the (unfinished) basement by the electrical junction box. I assume I need to hook up all the wires together to make the house phone wiring "hot"? Does anyone have any pointers/information on first steps involved with this... or do I just need to pony up and call the phone company to hook the wires up together? My recommendation is to NOT call the phone company unless you love giving money away. If you do want to give money away, then I can suggest some very worthy charities. You should have no problem connecting the wiring. I imagine that since you have wiring just dangling in the basement that the builder was doing a star topology - that means that every outlet has a cable coming back to a central location. Being an old phone guy, I would put in either a 66 block or a 110 block - these are terminal blocks you can buy at any good electrical supply. The cables "punch down" to these blocks and using them gives you a lot of flexibility in the future. A special "punch down" tool is required and they differ depending on the block you are using. However, you don't need to get that fancy. Just leave a healthy portion of cable (in case you ever want use the blocks) and strip back the cable covering. 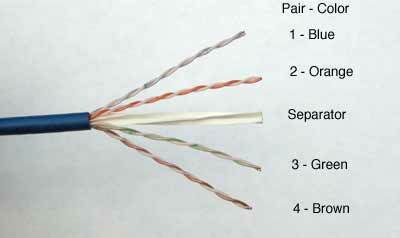 Inside you will find 3 or 4 pairs of color coded twisted pairs. The ones that will be connected to the line 1 part of your jacks will be the blue/white pairs. There will be another pair that is orange/white and a third green/white pair. There may also be a brown/white pair. These are used for line 2, line 3 and line 4 respectively. Like colors go to like colors - blue to blue, white with a blue stripe to white with a blue stripe, etc. I normally suggest using scotchlock connectors but with as many wires as you have, the correct size wire nuts will work fine. Let us know if you have any questions I have not covered.